Andy Murray's spectacular performances in the first week of his Wimbledon title defence thrilled his fans and left pundits grasping for superlatives. The British number one did not drop a set as he swept past David Goffin, then Baz Rola and Roberto Bautista Agut for the loss of only 19 games. But if life has been a cruise for Murray so far, choppier waters await in week two. In Monday's fourth round Murray faces Kevin Anderson, a 6ft 8in South African with a huge serve. Barring a shock, rising star Grigor Dimitrov and world number one Novak Djokovic also lie between Murray and a place in the final for the third year in a row. Four-time Wimbledon semi-finalist Tim Henman analyses Murray's game and sizes up his likely opponents. "Murray's strengths are his movement and his return of serve. His first serve is OK. His second serve? Be careful. When you get down to that final eight, final four, a lot is determined by that second serve. But he's a competitor, he will have the British fans behind him, and he has won two Grand Slams now. So he's got to take one match at a time. Do not look towards defending your title. If it is going to be, it will be." "Murray had a perfect first week," says Henman. "But he is playing just as well as last year and in some respects even better. "Admittedly, he hasn't played the best returners of serve but his first service percentage has been very high and he has been serving very aggressively, which is always going to be a good foundation for his game. "For me, the most impressive aspect has been the way he has been playing so aggressively, especially with his backhand. He is really stepping up, looking to flatten it out and hit it down the line. "The beauty of that shot against right-handed players is that it forces them to run to their forehand. You then open up the court and can look to move forward. "I'm not concerned that Murray hasn't really been tested yet. He really laid the foundations for his Wimbledon campaign by winning five matches at the French Open in Paris, where he was twice pushed to five sets. "Getting through the first week in any way, shape or form is a good thing. He has got matches under his belt and he hasn't lost a set so he's going to be really fresh for the second week." Kevin Anderson, a 28-year-old from Johannesburg, has never got beyond the fourth round of a Grand Slam, but is currently at a career-high ranking of 18 and overcame the talented Italian Fabio Fognini in the third round. Anderson has played Murray twice, both on hard courts. Murray won in straight sets in the 2010 Australian Open first round but suffered a 6-3 6-1 defeat in the Canadian Open the following year. "Anyone who is 6ft 8in and serves as well as he does is going to be a threat and Murray cannot afford to take him lightly," says Henman. "But if there is anyone who can return big serves it's Murray and I see him dominating the match. "I think he hits the ball better from the baseline and he certainly moves better than Anderson. The South African would have to have an incredible serving display to have an impact against Murray in his current form." Providing Murray defeats Anderson, his most likely quarter-final opponent would be Bulgarian 11th seed Dimitrov, who has won titles on three different surfaces this year. Top seed Djokovic lurks in the semi-finals, while seven-time champion Roger Federer and world number one Rafael Nadal are in the opposite half of the draw so could not face Murray until the final. "Murray against Dimitrov is a great match-up, a clash that everyone would like to see," says Henman. "Dimitrov has been touted as the future of the game. He is delivering the results and is really adding substance to his game. 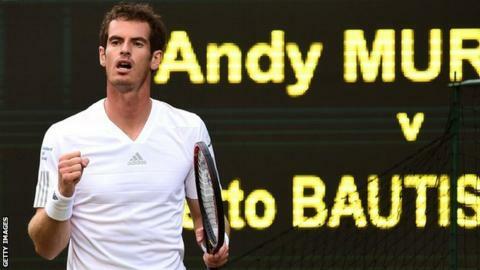 "But playing Murray in a Grand Slam would be a huge step up for him. He has only made one Grand Slam quarter-final - at the Australian Open this year - so I think Murray's experience would have a big part to play. I think Murray has the weapons to really take him apart. "Murray, of course, will be taking each game as it comes, be we're allowed to look ahead in the media and the prospect of Murray meeting Djokovic again on Centre Court is a mouth-watering one." With Murray yet to be truly challenged, we are still waiting to see how he responds to difficult periods in matches in the aftermath of his split from coach Ivan Lendl. The Czech former world number one was credited with wiping out Murray's tendency to lose focus when the chips were down. "For me the biggest challenge for Andy at the business end of this tournament will be dealing with adversity in matches, which is something that has never been easy for him," adds Henman. "But Murray has the title under his belt now. He is more experienced and I see no reason to believe he won't handle the difficult moments in matches just as well as he did last year. "All the signs are positive. Now it's down to Murray to deliver."